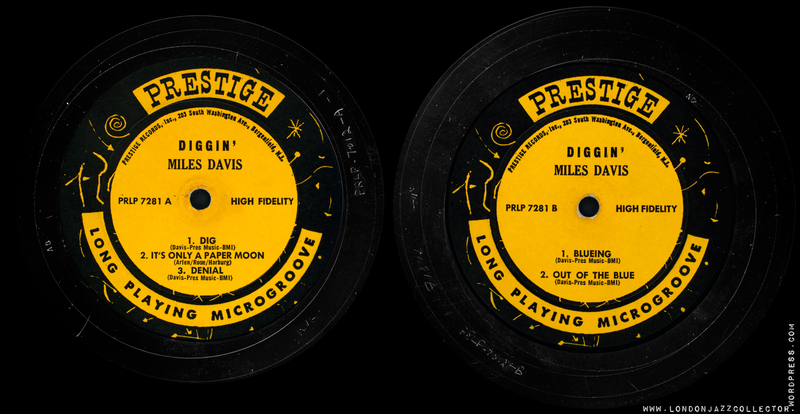 Miles Davis (trumpet) Jackie McLean (alto saxophone) Sonny Rollins (tenor saxophone) Walter Bishop Jr. (piano) Tommy Potter (bass) Art Blakey (drums) Apex Studios, NYC, October 5, 1951, original recording re-mastered by van Gelder in 1956. Context for this recording is a group of very young musicians – Miles, Rollins, Blakey, McLean not quite twenty – all early in their careers, all still to develop their final potential, beginning to work together, young musicians jousting and sparring, at the start of their ascendancy. Say AllMusic: I love this music, but I have to admit it sounds dated. 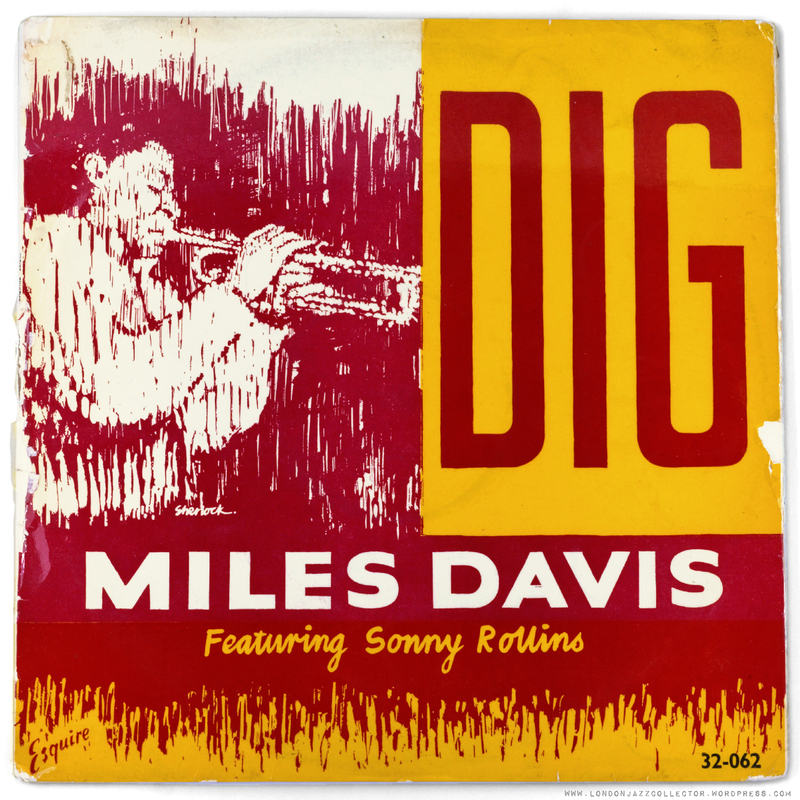 This wasn’t Miles Davis’ best. You have to come at this from a different direction. The interplay exposes formative relationships, future potential, the evolution of bop into a more expansive exploratory style with room to stretch, no longer imprisoned by 78 rpm shellac. It requires understanding, even to be savoured, for the stage they were at, not where it later went, something those familiar with the Davis First Quintet works will recognise. The expanded liner tell us Charlie Parker was reportedly present watching during part of this recording. You wonder what effect that might have had on the players? Though van Gelder had done what he could in remastering the original tapes, the limitations of 1951 recording technology are inevitably present. The audio never reaches audiophile level, sounding boxed-in and unevenly stratified between the different instruments, despite the van Gelder touch. Sound quality is restricted, though you quickly adjust to the baseline, and move on to the music for what it is. Sometimes you have to take off the audiophile hat. 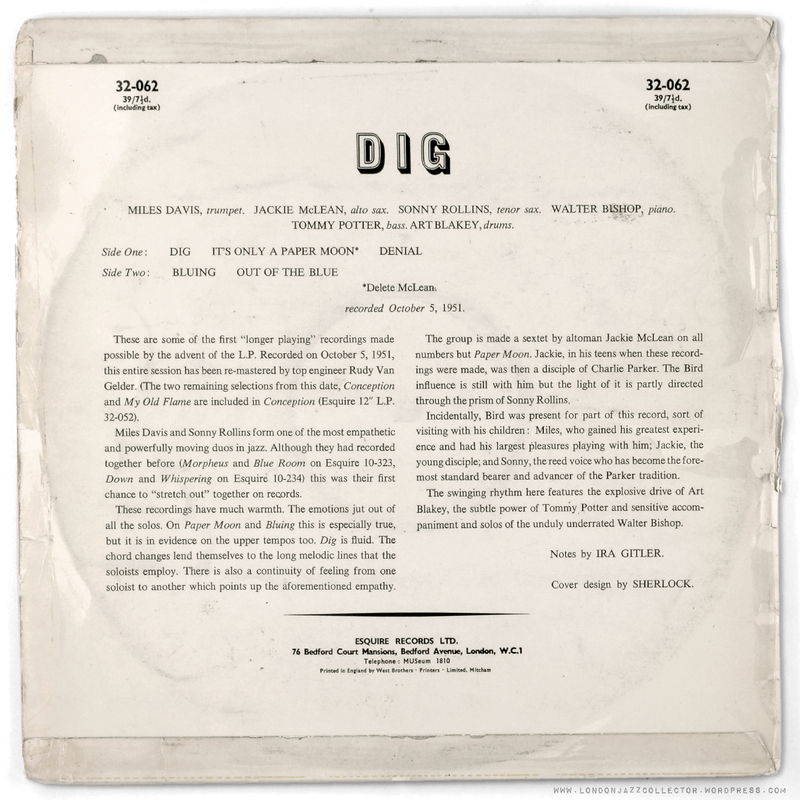 Along comes Bob Weinstock in the early ’60’s, financial pressures on all sides, needing to extract value from his catalogue, decides to reinvent PR 7012 Dig as PR 7281 Diggin’ – new title new cover, new liner notes, same music. A collector’s lot is not always a happy one. 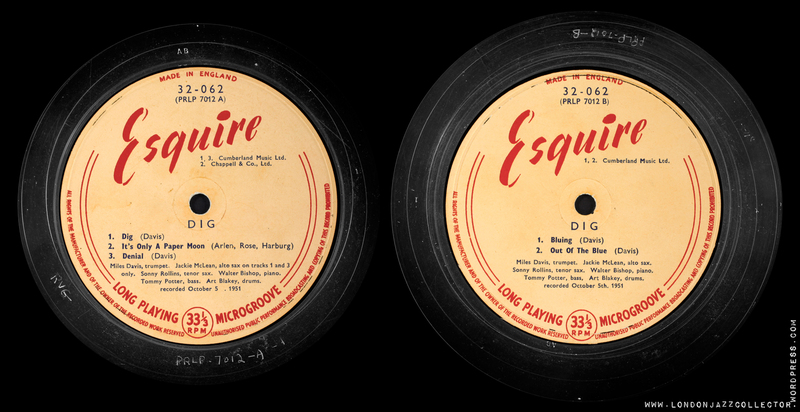 The Esquire was purchased before I had completed my study of Prestige reissue (mal)practice – alternate covers, new catalogue numbers and change of title – I was unaware that it was the same record had be re-released as “Diggin'” which I already owned. Still, never miss the opportunity to turn a “mistake” into a learning opportunity. What can we learn? The original Esquire and second issue by Prestige, side by side. Notice any similarities in the deadwax? In this case (and how many others?) the original Esquire is the same metalwork as the original Prestige, 7012. When Prestige reissued it in the early ’60’s as 7281 , they didn’t even update the master with the new catalogue number striking through the old number, as was customary later on. Instead, they pressed 7281 with the metal of the original 7012 and just slapped a different label on it. So 7281 is 7012, the only difference being the much fuller liner notes on the rear slick written by Ira Gitler dated August 1963, and a different cover art. 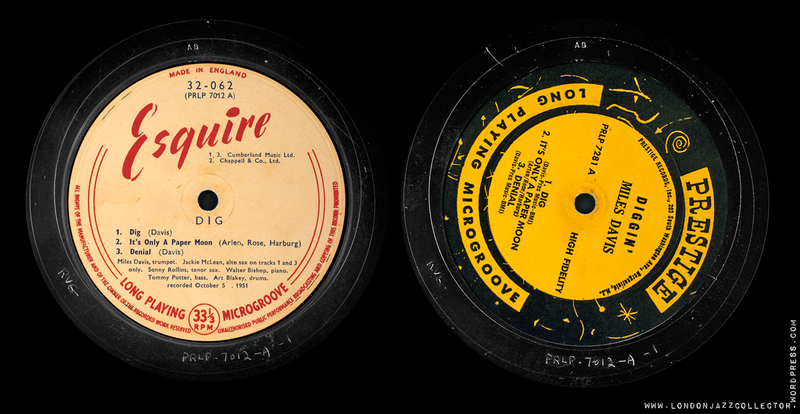 The Esquire and the original are sonically indistinguishable though I provide a rip of each to test for yourselves. See how generous I am?. 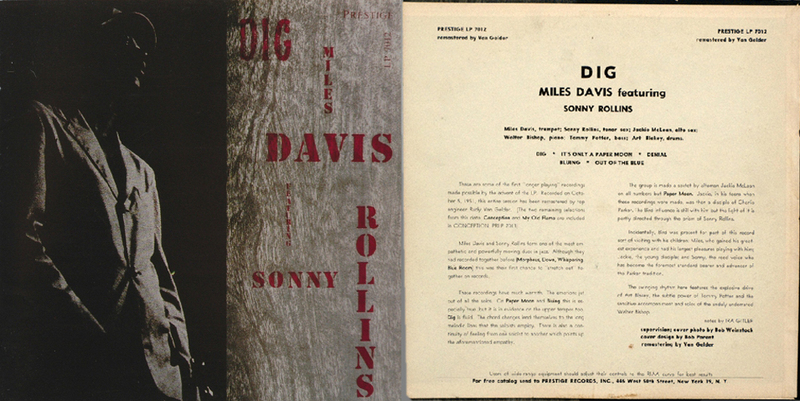 The context which Gitler’s new liner notes omit, perhaps because of its very commonplace presence among jazz musicians, is that at the time of the1951 recording Davis, Rollins, McLean and Blakey were all grappling with heroin addiction. There is no evidence here at least that it improved anyone’s playing, and becoming clean certainly accompanied the rise of each in musical stature. Some lessons learned, pick and choose you own. 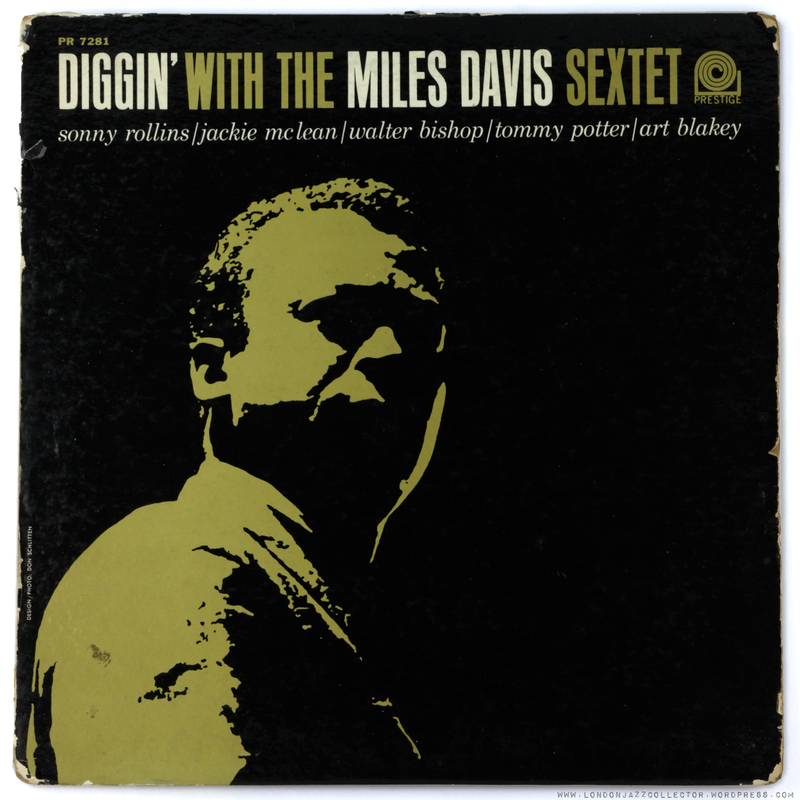 This entry was posted in Esquire, Miles Davis, Prestige and tagged Art Blakey, Jackie McLean, Miles Davis, Prestige, Sonny Rollins, Tommy Potter, Walter Bishop Jr. by LondonJazzCollector. Bookmark the permalink. how would the same men have sounded together six or seven years later, recorded by van Gelder? One can always dream. Great energy on display and yes I love it too. 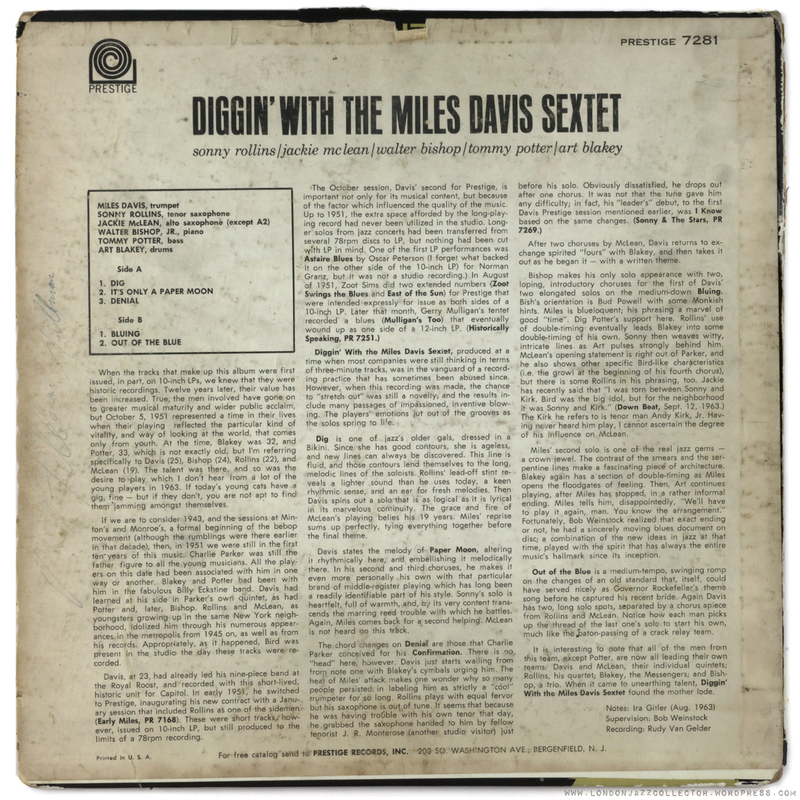 BUT….at times it sounds like Miles is making the same mistake a lot of guitar players in the early 70s made..went on too long at the expense of the other players. In both mixes the piano and bass is far too much in the background but maybe that’s as a result of when it was recorded. Esquire=mellow, Prestige=bright. Ok if you like Art’s drumming but I always think its a bit OTT. Honestly – I can’t tell the difference. I agree with LJC that the two versions are sonically indistinguishable, which makes perfect sense considering what he says about the metalwork used. Art Blakey never sounds good on these early recordings because no one seems to have been able to capture his, well, OTT cymbal playing. Early Miles and a worthy collection piece. I too wish I could get my hands on a mono original issue; and because LJC introduced this issue I am now officially back on the hunt. I agree it sounds dated, but is ALSO a fun listen. Energetic, boppish. Nothing not to like. Not every LP can be the very best one.